Jerusalem - Israel’s prestigious Dan David Prize was awarded Thursday to Canadian author Michael Ignatieff and Reporters Without Borders for their work in promoting democracy amid an authoritarian wave to crack down on academic and journalistic freedom. Reporters Without Borders and Ignatieff, president of Central European University in Budapest and a former leader of Canada’s Liberal Party, were honored for “Defending Democracy.” Other winners include Kenneth Pomeranz and Sanjay Subrahmanyam for work in macro history and Christiana Figueres for combating climate change. “The liberal democratic order faces a rising tide of new authoritarianism and populism; the very values that have sustained freedom and democracy are called into question,” said Ariel David, a member of the Dan David Prize’s board and son of the Prize’s founder. 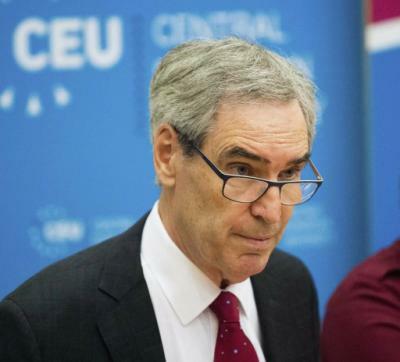 “My first reaction was utter astonishment, followed by gratitude and then, since this is recognition for work done in defense of democracy, the feeling that I still have lots to do” Ignatieff said.